AnonTab is an add-on for the Firefox and Chrome web browsers that enables you to load unknown or seemingly dangerous sites in a secure environment. While you may trust some sites to a degree that you visit regularly, you may have encountered situations where you wanted to be extra safe when visiting certain sites on the Internet. This can be for privacy reasons, to avoid handing over too many information to a site, or for security reasons, if you have reasons to believe that visiting a site might be dangerous or harmful. There are a couple of things that you can do, like installing security or privacy add-ons, using a different browser profile, or opening a page in the browser's private browsing mode. AnonTab for Firefox is an interesting add-on. The author describes it as taking the best from the NoScript and HTTPS Everywhere add-ons for Firefox, private browsing mode, and proxy use, and applying it all to the site in question. How does it work? The add-on installs without issues, and there is nothing to configure. You can right-click on any link and select "open link in AnonTab" to invoke the functionality. Please note that while you can download and install AnonTab for Firefox from the project's Github page or the Mozilla Add-ons Store, that the Chrome version is only available on Github. You need to prepare Chrome specifically to install off-Store extensions. 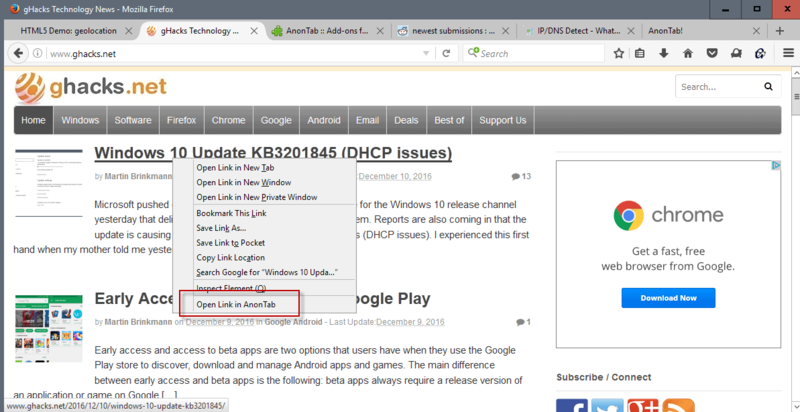 The Chrome extension may install in other Chromium-base browsers such as Opera or Vivaldi as well; I have not tried that however. The linked site will be opened in a new tab. The IP address of your device is masked via public Google proxy servers, SSL / TLS is enforced for the connection, and scripts are blocked on the site. Additionally, no logs or browsing history entries are kept locally. This sounds really good on paper, and it is, provided that the site and its content load fine. HTTPS is only enforced if supported by the page. If it does not support it, the HTTP version is loaded instead. So that is not an issue, but the blocking of scripts may be. Some sites are programmed to load only if certain scripts are loaded, while functionality may be blocked on other sites instead. This goes hand in hand with a lack of controls. There is no option to allow certain scripts to run, which extensions like NoScript let you do. If you encounter a site that does not work when you load it in AnonTab, then you cannot load it as there is no option to customize the methods of AnonTab right now. Most blogs and content sites will load, but you may not get comments or other functionality that is powered by scripts. The add-on is built on top of DomPurify, a XSS and HTML sanitizer. Now You: Do you use security or privacy add-ons? Google proxy servers ? How could that be a privacy improvement ? If intended for having a first secured and private look on a suspicious site then AnonTab fulfills that aim. Of course its very nature doesn’t make it suitable for regular visits but, occasionally, I consider it a blessing, so to say. to their whitelist. Manually or by clicking uBlock’s blue logo (which adds the opened site to uBlock’s Whitelist). Otherwise they’ll face a Network error. Thanks, Martin, for this complete overview of a very nice add-on. It’s a decent idea, but does routing traffic over to Google’s public proxy implies that Google will know what you are attempting to view anonymously? The objective is privacy and/or security. If your objective is privacy only, don’t use this add-on. If it is security for a particular site, then this add-on is useful. Google’s servers here are more of a transport than of a house. And it’s an occasional transport, even less than using Google’s Public DNS. Of course you’ll be spotted, as you already are by the number of 1E100 connections tied to almost all Web traffic. Using this add-on selectively, really for special requests based on suspicion reduces any related tracking as actively handling cross-site operations does. It’s a valuable approach, IMO, on a per-site approach only. Well … there’s also the question who you are privacy conscious about. Do you trust Google less than some random unknown webpage you’re about to access for the first time? Do you care that Google may have one more tidbit of data it can use to extend the (anonymous) profile it has of you? Most definitely so. I trust any random webpage more than Google because such random webpages aren’t present as third parties all over the web, and because random webpages don’t have monopolies on crucial products and services which are really hard to avoid without hampering your life these days. Compared to that, being fingerprinted by a single website is a lot less directly harmful. Regarding security, I use NoScript and uBlock Origin, so I don’t care about shady websites. I can visit them 99.9999% safely. I don’t need no Google proxy spying on my traffic, but should I be extra paranoid, there are things like Tor and Sandboxie. Finally, I simply never ever encounter a time when I need to hide my IP to a website but am fine having Google know it (+ know I am visiting the site). I can’t believe I was about to argue against something as obviously harmful as mass spying. Busting through open doors, that’s my superpower! I just installed it to see what it could do, but notice you have to type the whole URL to a site. Shortcut key combinations like CTRL+Enter won’t work. Also, there’s a background image which can’t be disabled using NoSquint Plus. Neither is it possible to turn pale grey fonts black which is another NoSquint Plus ability. So AnonTab had a very short life in FF today I’m afraid.